Scientists recently figured out a cool way to measure how much urine is in a public swimming pool. And the results are sure to turn some heads! Their sweet idea? They used the artificial sweetener acesulfame K (Ace K). The human body is unable to break down aspartame, which is why there are no calories. It’s excreted intact in our urine and stable in swimming pool water. Researchers closely followed two public pools and found nearly 8 gallons of urine in the smaller one and nearly 20 gallons of urine in the larger one. They also found high levels in the 31 other pools and hot tubs they checked. People are peeing prodigiously in pools. Do your friends a favor and teach your kids (and spouse) not to pee in the pool. Everyone I’ve talked to about this wishes other’s peed less. Be a good neighbor. Swim! It’s great to be outdoors and active and playing with others. Don’t let a little urine worry you. And I do mean little: the 20 gallons of urine was found in a 220,000-gallon pool. The water would only be 0.009% urine if it were poured in all at once. But the 20 gallons was the total peed over three weeks. It’s a tiny, tiny amount.And urine is typically clean and sterile. True, nitrogen compounds in urine can react with chlorine in pools and cause eye or respiratory tract irritation in some people. 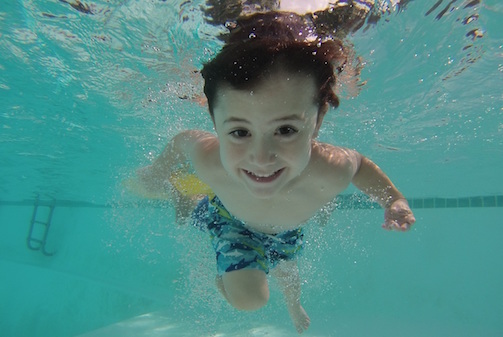 If someone experiences red eyes or wheezing, they might find a saltwater pool a better choice. Or less time in the pool. Or keeping the eyes closed underwater.But swim or play in a pool or ocean if you can. It’s a great way to be active outdoors. Here’s the big one: cut down on artificial sweeteners! The study inadvertently highlights how big a part of our lives artificial sweeteners have become in our relentless desire to keep our kids and ourselves at a healthy weight. There is no credible evidence that they help in our quest – and mounting evidence that they do the reverse.Artificial sweeteners can affect the bacteria in our guts, which in turn affect us. A few days of consuming Ace K doesn’t change gut bacteria in measurable ways – but ongoing consumption, as happens in so many of us, is linked to decreased diversity in the gut.Studies show that other artificial sweeteners can especially feed those bacteria associated with obesity. Oops!! !Some scientists are becoming convinced that by changing the makeup of the gut bacteria, artificial sweeteners could be leading to both obesity and diabetes. Scientists set out to measure and highlight water quality in swimming pools – and without intending to, highlighted the quality of the beverages we buy and the food we eat. Eat well. Drink well. And have fun in the pool! Artificial Sweeteners May Change Our Gut Bacteria in Dangerous Ways. Scientific American. 2015. Great Article Dr. As much as we should worry less about the pee in the pool. Personally, I don’t think it is fair on the part of others to actually pee in the pool. What goes around comes around. Pee in the pool today, someone else does that tomorrow, you’ll be affected too.